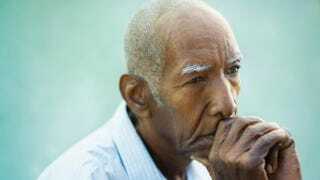 A study published in the American Journal of Preventive Medicine has shown that racism may accelerate aging in African-American men. Researchers at the University of Maryland found signs of accelerated aging in African-American men who reported high levels of racial discrimination and who had internalized anti-black attitudes, UMD Right Now reports. While it has been well-documented that African-American men have shorter life expectancies and a greater likelihood of suffering from aging-related illnesses at younger ages compared to whites, this is the first study to link racism-related factors to accelerated aging at the biological level. "We found that the African-American men who experienced greater racial discrimination and who displayed a stronger bias against their own racial group had the shortest telomeres of those studied," Dr. David H. Chae, assistant professor of epidemiology at UMD's School of Public Health and the study’s lead investigator, told UMD Right Now. Shorter telomere length is associated with increased risk of premature death and chronic diseases such as diabetes, dementia, stroke and heart disease, UMD Right Now notes. Ninety-two African-American men between the ages of 30-50 participated in the study. Each was asked about his experiences with discrimination in different settings, including work and housing, as well as in getting service at stores or restaurants or when encountering the police. They also measured racial bias using a process called the Black-White Implicit Association Test. According to the UMD group that conducted the study, the test gauges unconscious attitudes and beliefs about race groups that people may be unaware of or unwilling to report. Investigators found that a combination of high racial discrimination and anti-black bias was associated with shorter telomeres. On the other hand, the data revealed that racial discrimination had little relationship with telomere length among those holding pro-black attitudes, UMD Right Now reports. "African-American men who have more positive views of their racial group may be buffered from the negative impact of racial discrimination," explained Chae. "In contrast, those who have internalized an anti-black bias may be less able to cope with racist experiences, which may result in greater stress and shorter telomeres." Chae believes that the study is extremely timely, considering the social climate black men face. "Stop-and-frisk policies and other forms of criminal profiling such as 'driving or shopping while black' are inherently stressful and have a real impact on the health of African Americans," Chae told UMD Right Now. The most common form of racial discrimination reported by the participants in the study were experiences with police, followed by discrimination in employment. The study also found that African-American men are more routinely treated with less courtesy or respect and experience other daily hassles related to racism. Chae indicated that there needed to be additional research conducted that includes larger studies in which participants are followed. "Despite the limitations of our study, we contribute to a growing body of research showing that social toxins disproportionately impacting African-American men are harmful to health," Chae told UMD Right Now. "Our findings suggest that racism literally makes people old." Read more at UMD Right Now.